It looks like Jackie and I filled in the last bit of our itinerary for Peru which will involve spending some time in the Amazon Basin. I’ll be putting a up a more detailed itinerary so if, you know, you don’t hear from me after day fourteen you’ll know I was lost in ruins of the Inca’s or abducted in Lima, or whatnot. In any case, we were trying to decide between the southern coast for some sand boarding, surfing and wine tasting but we decided, considering we LIVE IN CALIFORNIA, we might want to try something different. 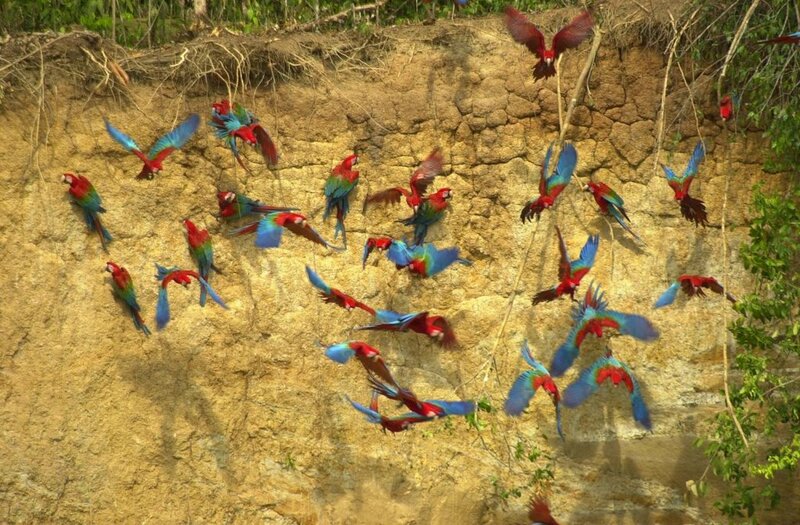 So instead, we’re going to the Bahuaja-Sonene National Park (formerly the Tambopata National Reserve) which is a vast swath of the Amazon jungle occupying the border region between Bolivia and Peru that was declared a national Park. If you’d like to get some idea of what it looks like there, I’ll direct you to the city of Puerto Maldonado. We’ll be flying in there and then taking a boat about four hours east. Go ahead and drag the map to the east (left) to get an idea of the terrain. You can keep dragging for a while. It’ll still be jungle. There are some obvious reasons to go to the Amazon jungle, Piranhas, Capybaras (the worlds largest rodent), pink freshwater Dolphins (Pink!) 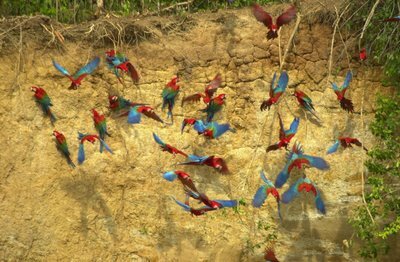 but one dream I’ve had ever since a wee lad watching nature programming on TV was to check out the infamous clay eating Parrots and Macaws of the Amazon. In the early morning, these and other similar birds will alight upon an exposed piece of clay, and eat it. Birds, there is no accounting for taste. It’s a form of Geophagy and the theory is they do it to purge toxins out of their diet. I figured I’d just fly down there and ask a few if they don't seem too busy easting dirt. "I believe that the vast majority of Americans are functional atheists, even though they tell themselves and others that they do believe in God. A "functional atheist" is someone who acts exactly as an atheist would. He does not go to church. He has ethics and morals, but they are based on many considerations other than what the Bible says. When he decides what he thinks about abortion, gay marriage, or contraception, he forms his opinion without serious consultation with religious beliefs. In fact, if he finds that his church has begun to disagree with his views on one of those issues, he might change religions and belong to a church that agrees with him. He might give to charity, but more because he believes in that cause rather than because he believes God has commanded him to be charitable. He doesn't celebrate any religious holidays, beyond exchanging presents at Christmas and taking Mom to brunch on Easter. If his religion requires him not to eat certain foods, he eats them anyway; if he is required to tithe, he doesn't; if he is required to stop working on a certain day, he checks his Blackberry. If his religion tells him something about how the world was made or works and that contradicts what science now tells us, he'll either believe the science or refuse to confront the question. At no point does he let his religion stand in the way of what he wants to do, or how he wants to act. Other than what's going on in this guy's head, is there any reason not to call this guy an atheist?"